The Mendocino Complex fire rages over Highway 20. Three fires — one in Redding, California and two in Mendocino County — are ravaging parts of California with a thriving cannabis economy. Six people, including two firefighters, have lost their lives so far. Less than a year after wildfires devastated the industrial centers of the Northern California cannabis industry in Sonoma and Napa counties, again massive fires have begun to dot the landscape between San Francisco and Oregon, threatening the state’s now-fully legal industry. For the last week, fires have raged across Mendocino, Shasta and Trinity counties. As of Monday morning, the largest and oldest is the Carr Fire, which has scorched 98,724 acres near Redding, California in the Shasta and Trinity counties. It’s currently only 20 percent contained, according to CalFire. Since the Carr Fire started on July 23, two firefighters lost their lives battling the fire and four civilians have also perished. Over 723 residences, three commercial structures and 240 outbuildings have burned down. An additional 5,000 structures are under threat from the blaze, which is being battled by an army of 3,388 fire personnel, 334 fire trucks, 68 bulldozers forging fire lines and 17 helicopters, according to CalFire. Despite the best efforts of authorities, ultra-low humidity and high heat have aided the fire’s dramatic spread, since it started a week ago with a motor vehicle malfunction. CalFire released a situation summary on Mendocino early Monday morning. So far, the Mendocino Complex has destroyed 12 residences, but the area is far from in the clear. CalFire estimates over 10,200 structures are currently at risk of being destroyed by the flames. But should all go to plan, they’re hoping to have both fires completely contained by Aug. 6. Both fires aren’t far from Highway 101, the lifeline of the Emerald Triangle. Tens of thousands of farmers across Northern California live down mountain roads that originate on the 101, as the highway runs north over the Golden Gate Bridge, cutting a winding trail through the redwood forests and hills all the way to Oregon. Unfortunately, for the second time in a year, it’s more critical as an evacuation route than keystone of the industry supply chain. In fact, the shock and awe of going through a devastating fire season again are certainly being felt in the cannabis. That weariness appears to have hindered support efforts in the short term. California Growers Alliance Executive Director Hezekiah Allen said that he hasn’t heard about any support efforts for those cannabis industry actors impacted by the first this week. Dr. Amanda Reiman of Flow Kana, a California cannabis brand with a campus called the Flow Cannabis Institute based in Mendocino, told Cannabis Now that the non-profit North Coast Opportunities, which provided community support during the 2017 wildfires, is still the best way to donate right now. She also said that those people located in Northern California could drop off needed goods — including water, non-perishable food, towels, diapers, toilet paper, animal food and toiletries — in Ukiah right now at 4865 Eastside Calpella Road. 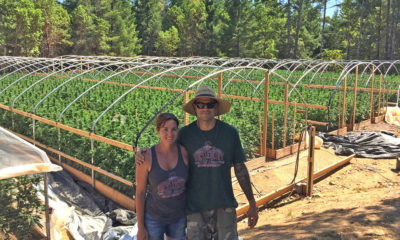 Alien Labs, a Sacramento-based cultivation group which got its start in Redding, has also started a GoFundMe to support those affected by the Carr Fire, which they say they’re currently using to put evacuated families up in hotels. TELL US, have you been impacted by the California fires?